The Trump administration has hinted it may soon sell 60 F-16s to Taiwan in what observers say would be a “huge shock” to China. Selling the F-16s to Taiwan, which has sought the jets for more than a decade, would add to several other moves the U.S. has made in support of Taiwan in recent months amid President Donald Trump’s deal-making on trade with Chinese supreme leader Xi Jinping. 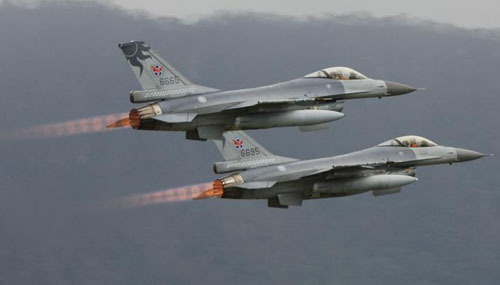 Taiwan has been looking to replace its aging fleet of F-16s for over a decade. Despite China’s objections, the U.S. on March 24 sent Navy and Coast Guard ships through the Taiwan Strait. Last week, China protested the U.S.’s accommodation of Taiwanese President Tsai Ing-wen in her stopover in Hawaii. U.S. has bolstered ties to Taiwan amid calls in Washington for a “whole-of-government” effort to prevent China from surpassing American military and industrial dominance, analysts say. China has invested heavily in military hardware over the past two decades, building a world-class navy and filling its coastline with missiles capable of hitting Taiwanese targets. The country spent 23 times more than Taiwan on defense in 2017, up from double in 1997. “Any words or actions that undermine the one-China policy are tantamount to shaking the foundation of China-U.S. relations, are inconsistent with the fundamental interests of China and the United States and are also extremely dangerous,” Col. Wu Qian said at a briefing in Beijing on March 28. The Pentagon says the United States has sold Taiwan more than $15 billion in weaponry since 2010. Presidents since Bill Clinton, however, have repeatedly rebuffed Taiwan’s requests for new fighter jets and other advanced weapons systems that could provoke Beijing. President Barack Obama agreed in 2011 to merely upgrade Taiwan’s aging F-16 fleet. The U.S. Defense Intelligence Agency released a report earlier this year describing Taiwan as the “primary driver” for China’s military modernization. Rand analysts argued in a 2016 report that China’s sophisticated short-range ballistic missiles could “cut every runway at Taiwan’s half-dozen main fighter bases and destroy essentially all” parked aircraft in a conflict. Any planes that made it in the air could face Chinese pilots flying jets such as the J-20, a “fifth-generation” stealth fighter considered to be a rival to Lockheed’s advanced F-22s and F-35s. The U.S. refused Taiwan’s request for F-35 fighter jets.